This is the third album by young and upcoming Polish Jazz violinist / composer Bartosz DworakFind albums by this artist, recorded with the same quartet that was featured on the two earlier recordings with pianist Piotr MatusikFind albums by this artist, bassist Jakub DworakFind albums by this artist and drummer Szymon MadejFind albums by this artist. The album presents seven original compositions, four by the leader, two by Matusik and one co-composed by Dworak and Matusik. 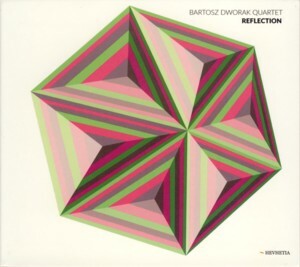 The music continues the path set by Bartosz Dworak´s earlier recordings, presenting highly melodic and very lyrical compositions, kept well within the mainstream Jazz convention, with strong Polish Folkloristic influences. The music is slightly more open this time, with a lot of breathing air, which allows the rhythm section to become fully involved in the improvisational process, and as a result enables the listener to appreciate the splendid bass parts played by Jakub Dworak and tasteful drumming by Madej. But the soloing and front position is of course reserved for Bartosz Dworak and Matusik, who take care of the melodic contents. Dworak uses the synthesized violin on a couple of tracks, which adds another variation to his sound. The compositions by Dworak are more up tempo and have a distinct Rocky character, whereas those by Matusik are more romantically inclined which balances the overall content of the album and keeps the listener interested. All these four young musicians perform splendidly throughout, which of course is quite usual for young Polish Jazz musicians, who are well schooled and experienced, today better that ever before. Overall the album is a very solid and well balanced effort, which offers beautiful music and superb execution from start to finish and should satisfy most Jazz enthusiasts, especially Jazz violin connoisseurs. It does not break any new ground as far as Jazz or Jazz violin is concerned, but offers a splendid listening experience, which is definitely worth investigating.